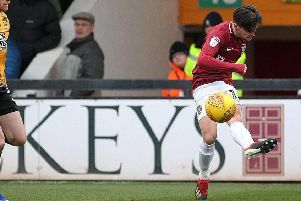 Boss Chris Wilder has spoken of his admiration for the Cobblers supporters, ex-players and fans from other clubs that have been digging deep in a bid to keep the club alive. The Northampton Town Supporters Trust announced this morning that their fund-raising effort to #savethecobblers has topped the £50,000 mark, with the total boosted by more than £4,600 being collected ahead of the weekend FA Cup clash at Coventry. That collection was boosted by the support of the Coventry Supporters Trust, with the Sky Blues fans putting their hands in their pockets, and there have been donations to the appeal’s Just Giving page from supporters of clubs all over the UK, and from further afield. Former players such as striker Adebayo Akinfenwa and goalkeeper Mark Bunn are also auctioning off match shirts they wore while playing at Sixfields, with the offer for Bayo’s signed jersey from the day he scored a hat-trick at Accrington Stanley currently standing at an incredible £7,600 with one day of bidding still to go. Many supporters have also auctioned off memorabilia of their own in what has been an exceptional effort. The club, which owes the Northampton Borough Council £10.25m, is also due in the High Court on Monday to face a winding-up petition from HMRC for an unpaid tax bill of £166,000. Hopes are high that a takeover from former Oxford United chairman Kelvin Thomas will go through in the next couple of days, and that the future of the club will be secured, but whatever happens Wilder has been overwhelmed with the efforts of everyody involved with the Trust fund-raising effort. “The only thing that matters is survival, and what happens over the next few days,” said the Cobblers boss. “It would be a huge boost for everybody (if the takeover were to go through). “The supporters have shown how passionately they care about the football club, it is their club, and I have to say it’s not just supporters from Northampton Town. “You look at at ex-players, and I see big Bayo and Mark Bunn doing things, and other players chipping in, and supporters from far and wide doing their bit. “It is an outstanding achievement from guys that are not working at the club, but they have a connection to the football club. “People taking bucket collections, the Coventry fans at the weekend. “James Whiting, the chief executive, put it in good words when he said he thought the Coventry fans were a class act on Saturday the way they went about things.